A power saw used in woodworking, consisting essentially of a toothed metal band coupled to and continuously driven around the circumferences of two wheels. Band saws range in throat capacity from 8" to 36", with either two or three wheels for the blade. Blades for the home shop range from 1/8" to 1" wide, the narrow blades are used to cut small radius curves, the wide blades are used for straight cuts such as resawing. 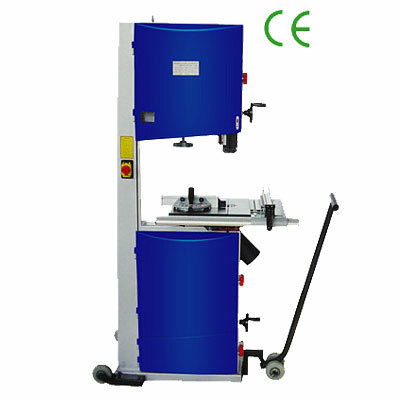 A good quality band saw properly set up it will become one of the most used tools in your shop. Choose at least a 14" model if you plan to do much resawing, the smaller models are a bit too light. Most would choose a band saw over a table saw if only one of them could be had, they are so much more versatile. Cutting dados is not possible on a band saw but they can be done on a router.